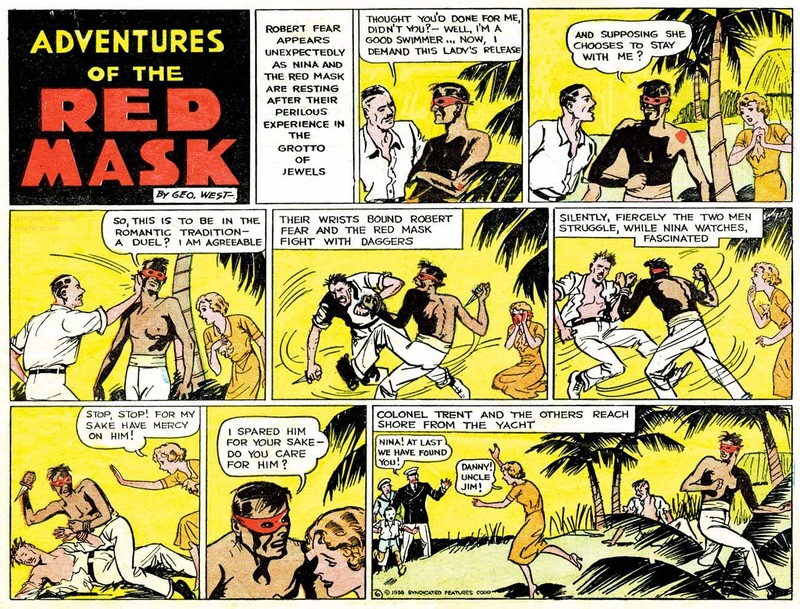 By far the most interesting strip in the Syndicated Features line-up was Adventures of the Red Mask. 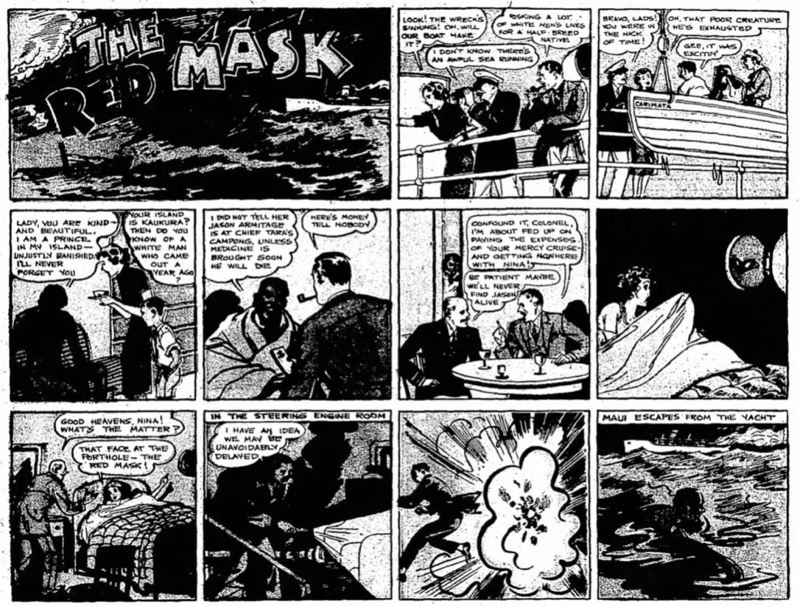 The Red Mask was a heroic figure pretty obviously inspired by The Phantom, which had debuted in newspapers less than six months earlier. The strip was frenetically paced, and I haven't seen quite all the episodes, so there may be some holes in my understanding of the plot. 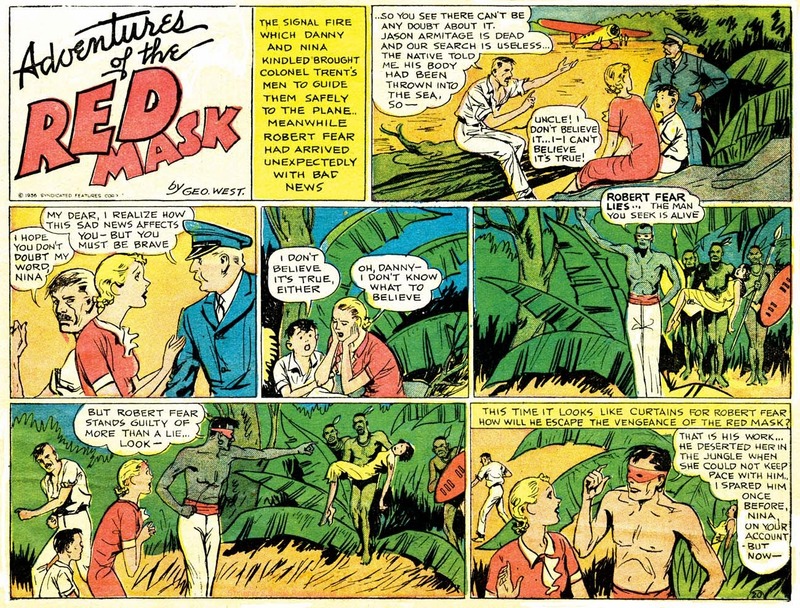 It seems that the Red Mask is a deposed ruler over an island jungle kingdom. He's a wanted man by the new rulers, so he dons the mask while he tries to marshal his forces to regain power. While plotting to take back his kingdom, he gets involved with a bunch of silly rich folk who come to the island looking for a fellow who was marooned there some time before. In the process they wreck their boat and then manage to get separated into several groups. Much of the action involves the Red Mask saving them, collectively or individually, from various fates worse than death. One of the party, Robert Fear, turns out to be a black-hearted villain, a real Snidely Whiplash sort. The Red Mask and he fall in hate at first sight, and the real fun begins. It's all great fun, with just the lightest sprinkling of logic and plotting. Yup, the final episode is still in mid-story! We are left hanging never knowing the true identity of the Red Mask. The feature is credited to George West, who neither I or Alex Jay can track down. Is it a pseudonym? The art is serviceable, but it's not a style that reminds me of someone else who'd want to hide behind a pen-name. West is the only creator who didn't stick around for the entire run of the Syndicated Features tabloid section. Adventures of the Red Mask ended after episode #26, and was replaced the next week by Adventures of Nervy Nerts. 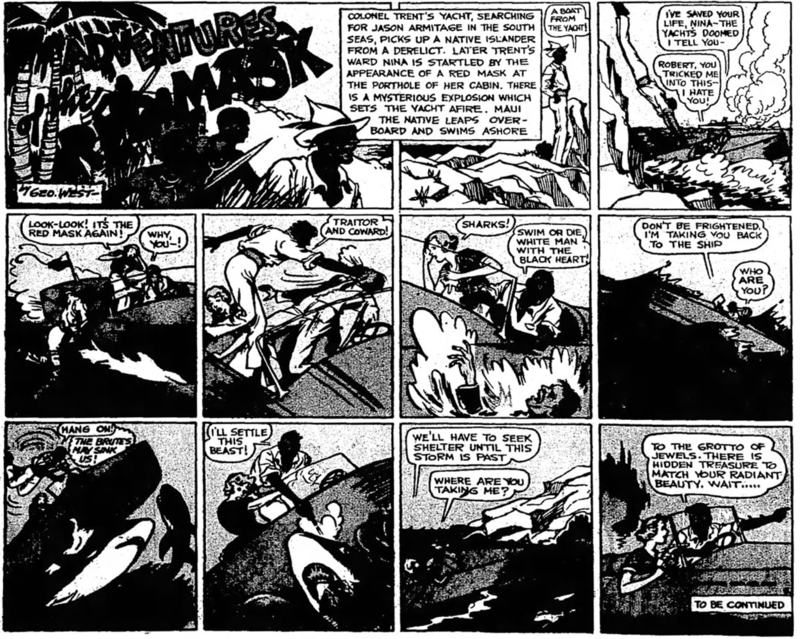 The new strip was credited to George Scott, but I think it is possible, even probable that the new credit is just another pseudonym of the same guy. Hmm. Interesting thought. He was ending his run on Bobby Thatcher shortly after this; maybe he was trying this out as a new gig, because he pretty much drops off my radar after Bobby Thatcher, until he pops back up doing comic book work in the 40s. The style doesn't exactly scream George Storm to me (he's a bit more cartoony than this typically). I've been puzzling over this, because a black hero being published while Jim Crow was the law in the South is fascinating. I don't think the Red Mask was originally meant to be Armitage—why call himself Maui if so? I agree we can't know what the writer would've done. 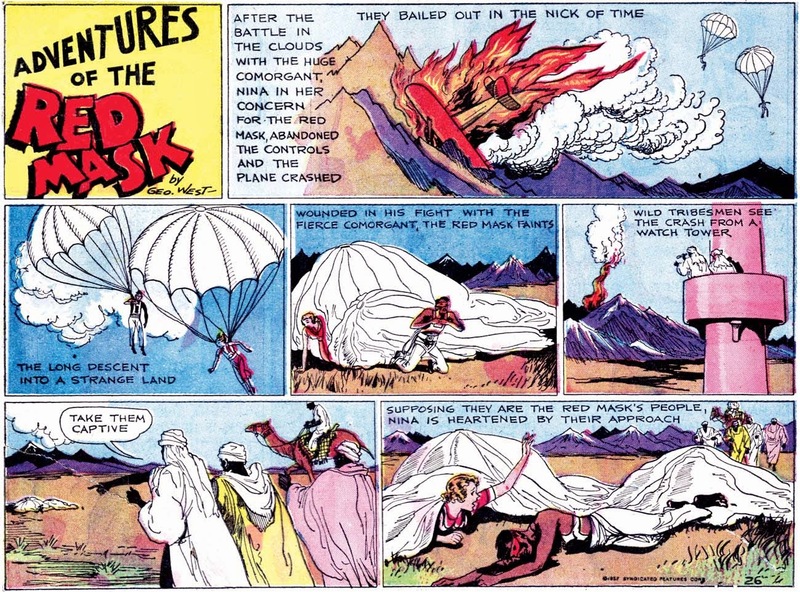 I also agree with the people who say he's Polynesian or Malaysian, not African, but that doesn't really distract from the fact that in his adventures, he's dark-skinned. George Storm seems likely. The Red Mask appeared when he was thinking about leaving or had actually left Bobby Thatcher.